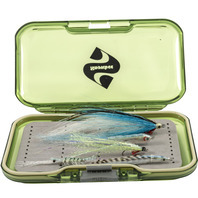 With the ever increasing popularity of saltwater, carp and pike fly fishing we have included a Saltwater Predator model to the Spectre range. This is not just the standard rod with a different logo! 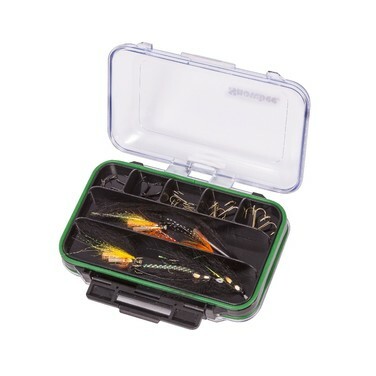 Purpose-designed for the requirements of these fly fishing disciplines, the blanks have steeper tapers and thicker wall profiles to handle the larger, more powerful fish likely to be encountered. 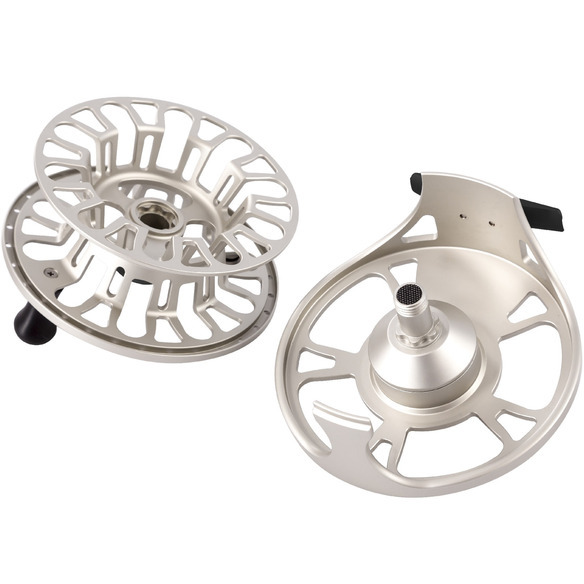 Brushed aluminium-finish reel seat and high chrome guides, make the Spectre SP stand out from the crowd! 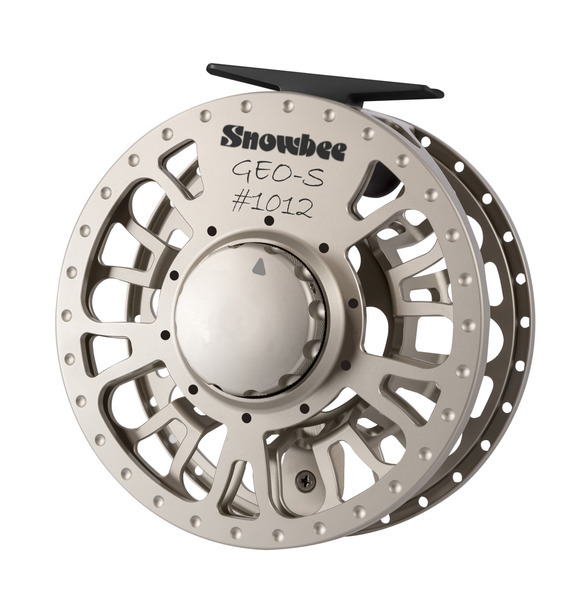 By popular demand, 2019 sees the return of our amazing Geo-S fly reels. The design brief was for a range of reels, with which the world’s fly fishers could take on the best that the largest rivers and widest oceans could throw at them… and win! 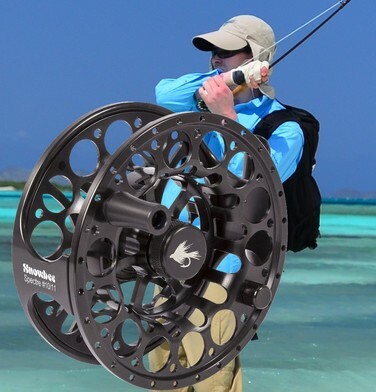 This 'stacked drag disc' system is similar to that used in our original XS reels made by British Fly Reels all those years ago, in that some discs are 'locked' and some are free to rotate at their own speed. 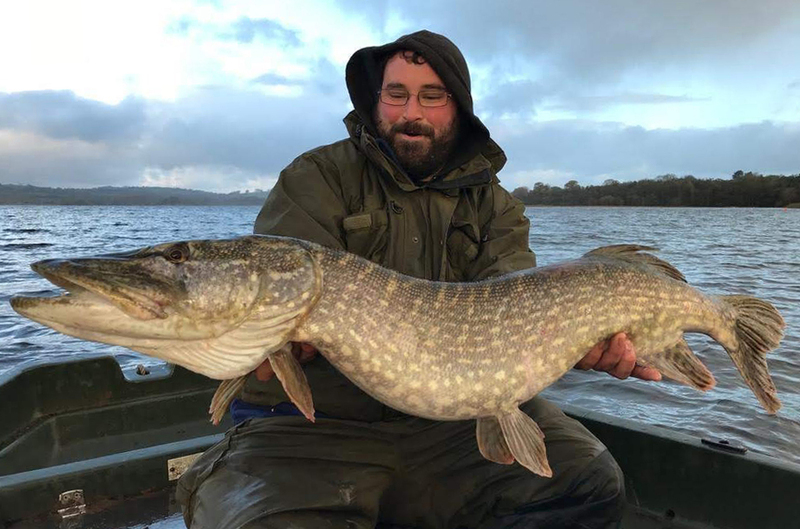 This not only allows for an ultra-smooth start up when a fish takes, with the drag discs all starting at their own speed, but the multi-surface drag provides a class-leading 46.5cm2 of drag surface area! Hard anodised in 'satin silver' for total chip and corrosion resistance. Tippet retaining O-ring on spool counter-balance. The 1012 model has a class-leading line capacity which will comfortably swallow a long-belly spey line with ample backing to spare. 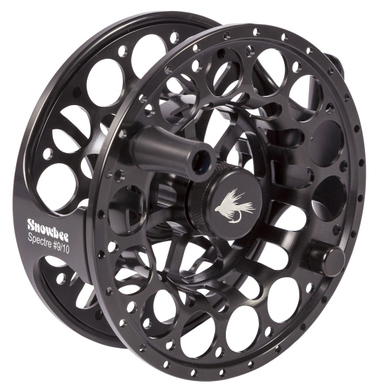 Whether your target species is Atlantic or Pacifi c salmon on the fastest of rivers, sailfi sh and tuna on the world’s oceans, or monster tarpon in tropical mangroves, this powerful reel will cope comfortably with it’s amazing drag system delivering up to 6.5kg (14lb) of drag. 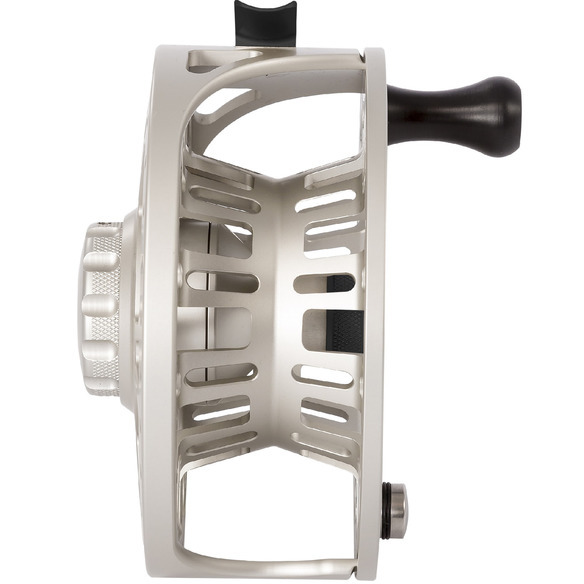 The multi-disc cork and stainless steel centre drag, offers superb performance, with minimal startup inertia, while the large arbor design allows faster retrieve, more consistent drag performance and minimal line memory. The stainless steel main spindle coupled with the one-way roller clutch bearing, provides instant drag control, when that ‘smash take’ catches you by surprise. 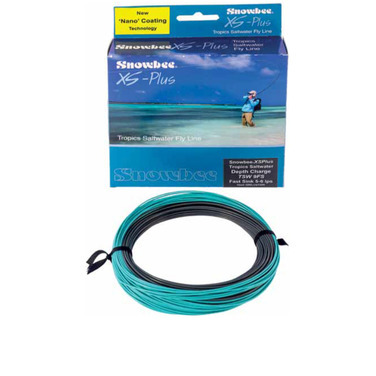 Extra hard paint finish for salt-water and chip resistance, quick release spool and easy left to right hand conversion, makes the Spectre the perfect choice, for long, untroubled fishing use.The extended range covers all requirements from the smallest brook fishing up to salmon, sea trout and saltwater. 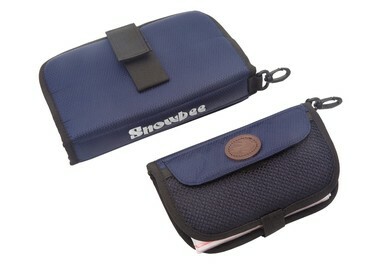 Complete with a Neoprene reel case, this range offers unmatched performance coupled with value for money. 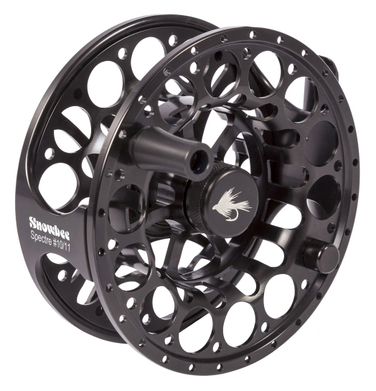 Our Spectre #9/10 offers the salmon or saltwater angler a quality reel with ample backing capacity and enough ‘stopping power’ to handle anything you may come across. 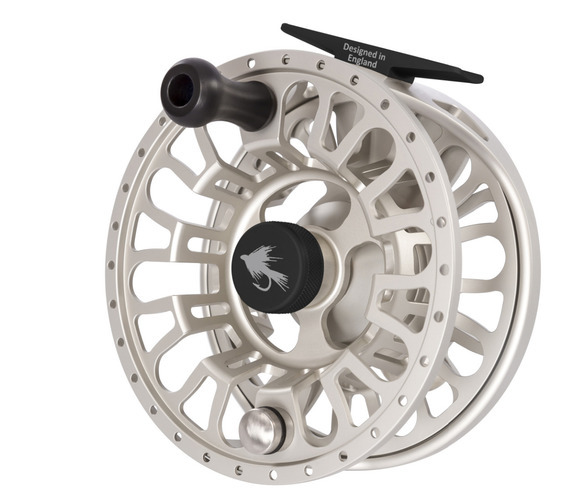 The Spectre #10/11 is the perfect choice for the Salmon angler fishing big rivers with big lines. Capable of holding a full #10/11 Spey line plus 300yds of backing. Equally suited to heavy Saltwater fishing. 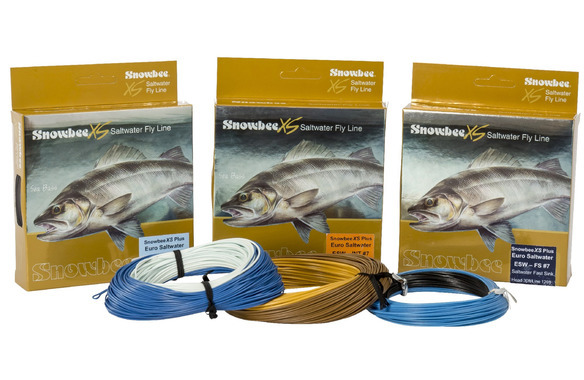 With the growth in saltwater fly fishing around our shores for bass, pollack, wrasse and even mackerel, we thought it time to introduce a range of fly-lines designed specifically for the purpose. 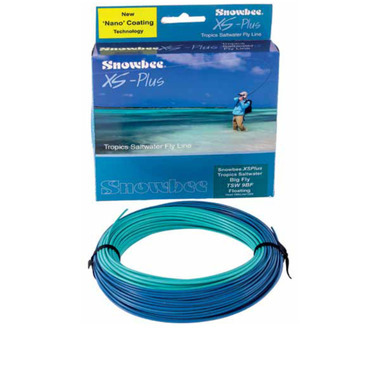 The new XS Euro Saltwater lines are designed specifically for temperate climes, where the harder, temperature resistant Tropics lines are not required. This allows us to use our normal coating mix, for a super-slick finish and memory-free performance. 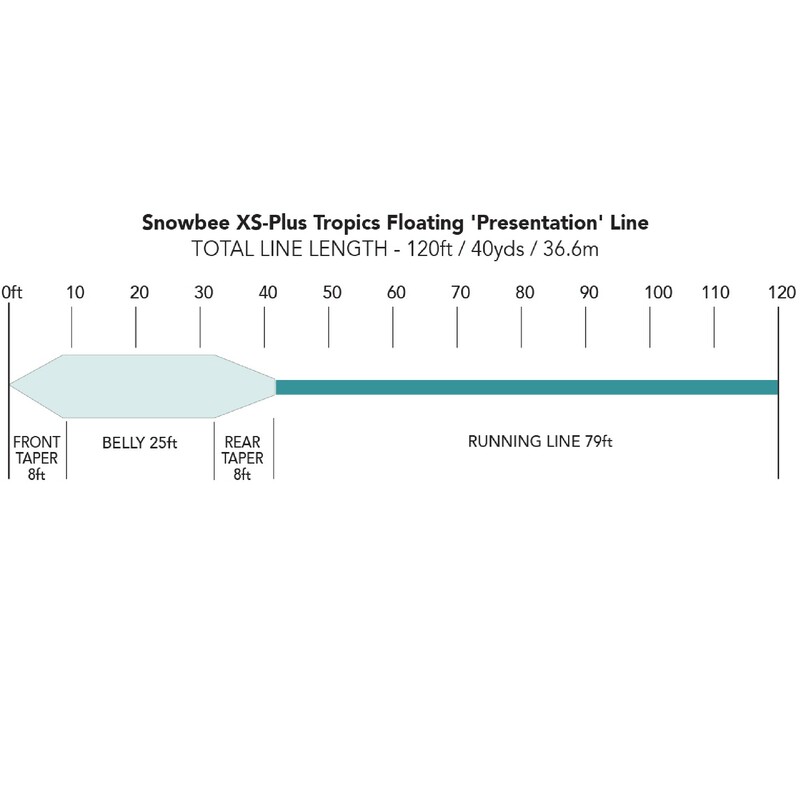 The Floating and Intermediate models have a long 44ft head, with a fine 76ft running line. 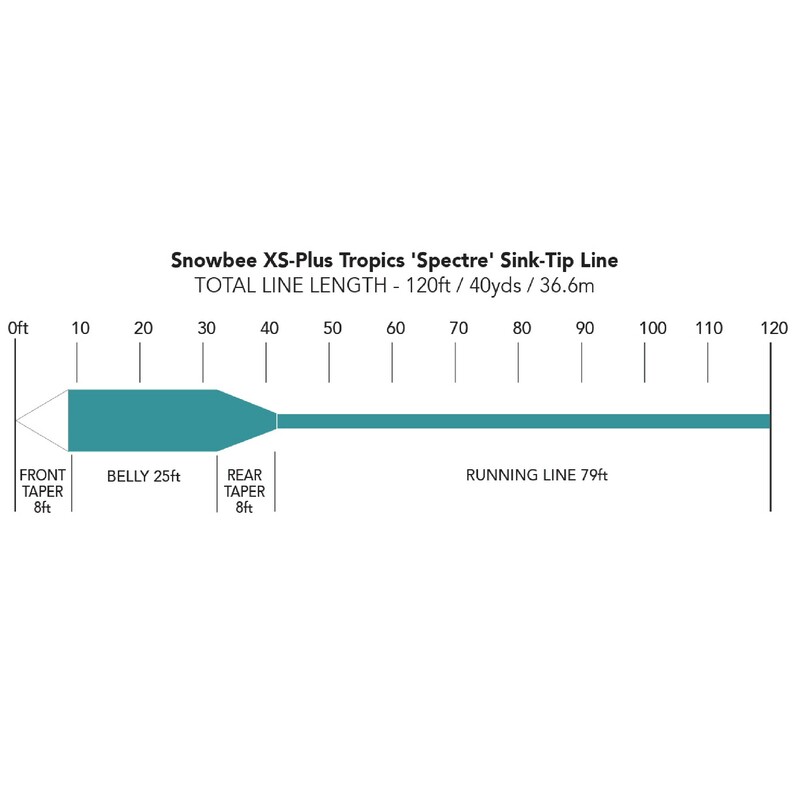 The fast-sink model has a short 30ft head, joining a fine 90ft running line. All three outperform conventional lines and allow you to reach those far structures, or the breaker-line, where predatory fish are holding. By careful manipulation of our ‘Nano Technology’ coating material, we have developed a new coating which is harder than usual, to withstand the rigours of the saltwater environment, but more importantly, retains its characteristics, even in the searing heat of the tropics, or on the hot deck of a flats skiff. 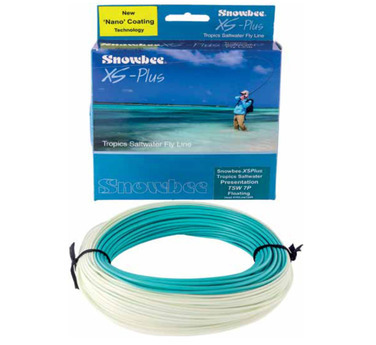 This allows us to retain a core line, which ensures the supple, memory-free properties, customers have come to know and expect from a Snowbee fly line. 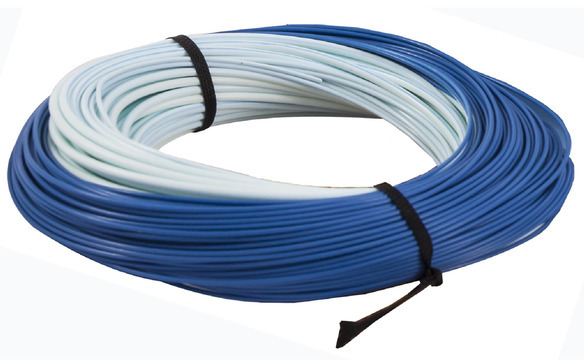 This also makes the new range ideal for temperate climates, when fishing for striped or European bass. A floating line with a longer head and extended tapers, designed for smaller flies and precise presentation. 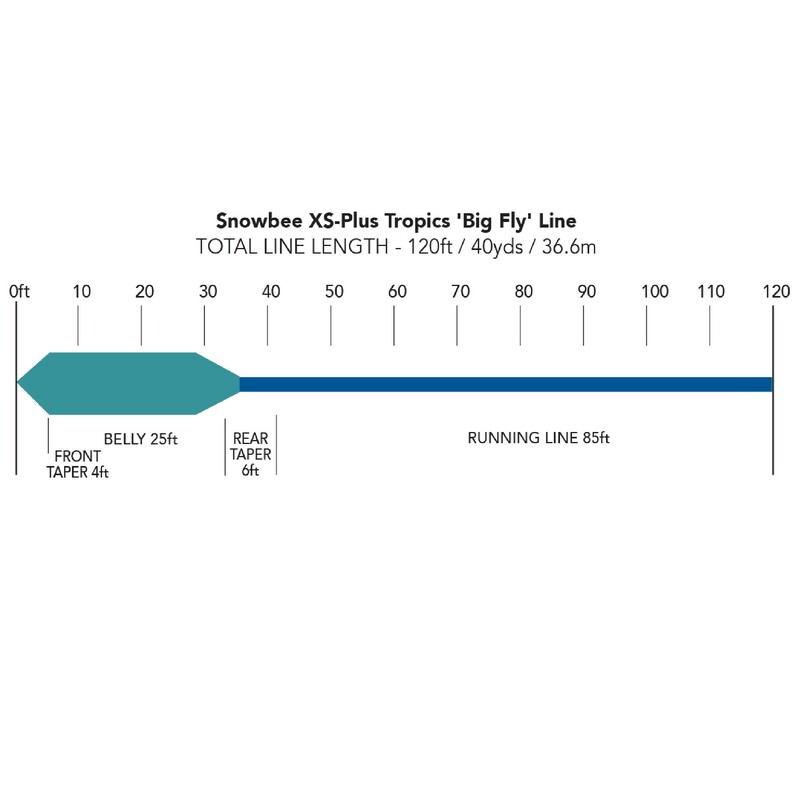 The ideal line when ‘sight fishing’ for bonefish, permit, jacks etc., where a smooth and quiet ‘lay-down’ of the fly is essential. The colour change at the back of the head, notifies the precise shoot point, which together with the fine running line makes distance casting effortless. Short, steep tapers and a short head designed for turning over big flies in confined spaces. 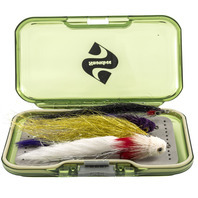 Ideal when fishing big flies in amongst mangroves, or overhanging vegetation for tarpon, or any ‘open water’ application where big flies are essential. 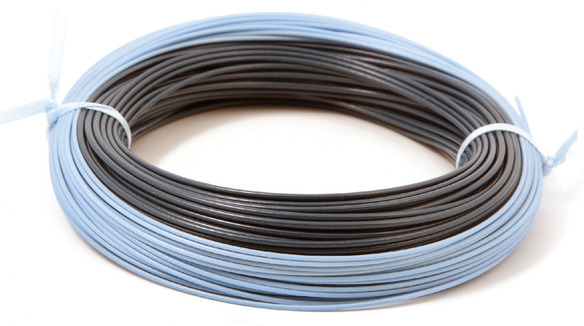 A colour change for the running line notifies the precise shoot point when longer casts are required. For a more ‘stealthy’ approach the ‘Spectre’ line has the same long head profile as our Presentation line, for delicate presentation. 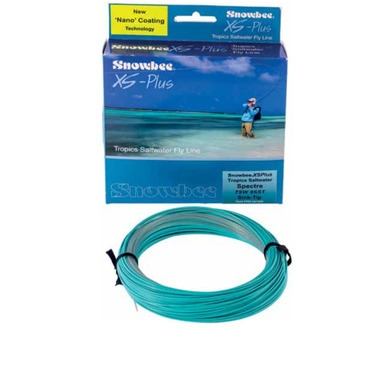 A floating head and running- line, with a 12ft clear intermediate tip. The 2-2.5ips tip will take flies down deeper, without spooking the quarry. 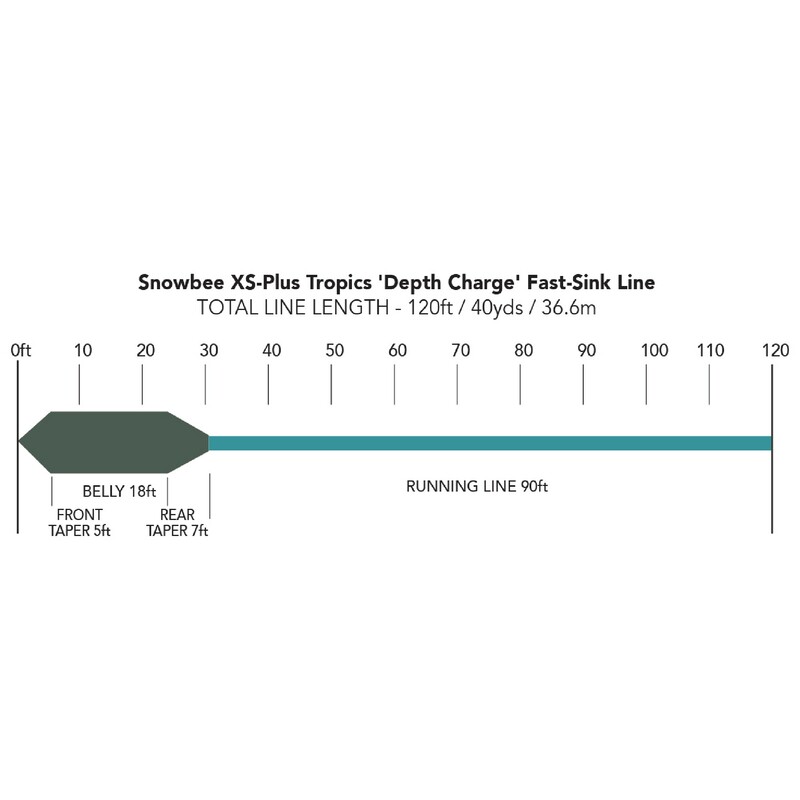 When you need to get down deep and fast with either short or long casts, our new Tropics ‘Depth-Charge’ delivers on all counts. The short, shooting head profile and fine running line, will punch through a stiff wind effortlessly, whilst the 5-6 ips fast-sink head will get your fly down fast, to the ‘strike zone’. The colour change at the back of the head, notifies the precise 'shoot point' making distance casting effortless. These selections offer a range of uncomplicated, modern patterns in striking colours and designs, plus a few of the old faithful, like the traditional Scottish salmon patterns in popular hook sizes. The salmon singles are tied on a selection of traditional black and modern nickel silver hooks whilst the sea trout patterns need no introduction either. 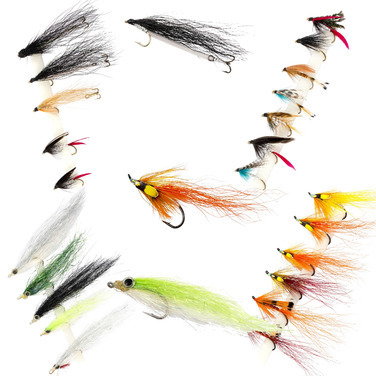 These are a simple, select range of the most popular traditional sea trout patterns plus a modern card containing stinger trebles on wake flies, which when testing, accounted for some great fishing and all have a unique habit of going savagely ‘bump’ in the night! Finally, there is a small card of popular Bass Deceiver patterns for prospecting off the shore for that most illustrious of saltwater predators. 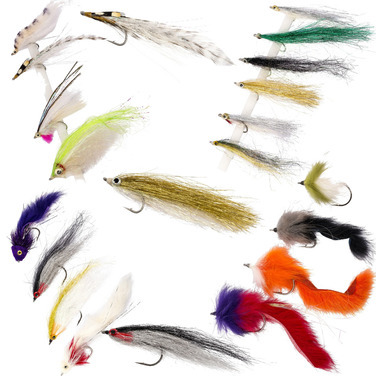 Our Saltwater/Predator selections offer the destination fisher and those ‘fishing the salt’ nearer to home a great range of patterns to tempt any predatory fish from bonefish and tarpon to hard fighting bass and pollack. Be ready to ‘hangon’ though as our predator patterns, tied from traditional and modern synthetics for light casting, might just be about to catch a toothy critter more than you bargained for! Also included is a mixed selection containing some mobile and light casting pike flies plus a full ‘weed less’ card, for that stealthy presentation amongst the snags. 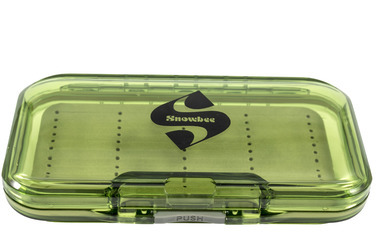 This new, innovative fl y/lure box covers a multitude of uses. Moulded in tough, crack-proof ABS plastic, with a clear lid for easy fly identification. Single-sided to allow it to accommodate deep flies, it is fitted with a long-slit ethafoam base making it ideal for large salmon, pike and saltwater flies, but equally suitable for small spinners such as ‘Flying-C’s’ or Mepps. There are 11 rows of 4 x 1” slots, providing plenty of storage space. A simple spring latch mechanism holds the lid securely when closed. but equally suitable for small spinners such as ‘Flying-C’s’ or Mepps. 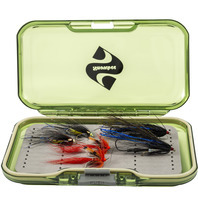 A Tube Fly Box based on our Waterproof body moulding, but featuring open compartments both sides, to hold a full range of tube flies, trebles, Waddington Shanks etc., in one neat box. 7 compartments one side, including 2 full length compartments for long tube flies and 9 smaller compartments the other. Imagine how many conventional fly boxes you would need for that! These sets of bags are removable, so you can keep spare sets, pre-filled with flies for different species. On the front of the wallets is a mesh pocket for tools, leaders etc. There is a belt loop to carry on the waist, or a clip to attach to any convenient D-ring. Perfect for fly-tying materials too. 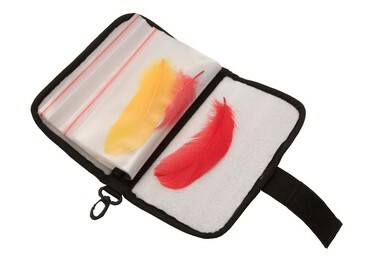 Available in two sizes, Small(19444) and Large(19443) these wallets are ideal for easy and secure storage of feathers and fly tying materials or for larger flies used for Saltwater and Predator fishing. Spare insert bags available. 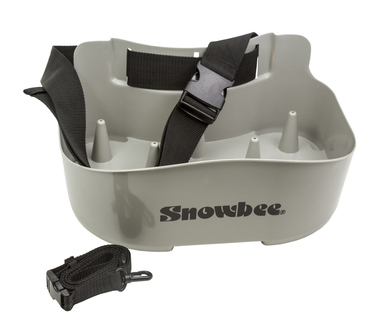 As you’d expect from Snowbee, our new Rig / Trace wallet is a bit different! 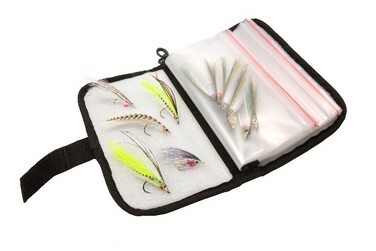 12 heavy duty, clear trace pouches in 2 sets of 6, held in place with a neat Velcro spine. Easily removable and extra sets can be added, or removed as required, so you can keep different rigs in each set and only take what you need. 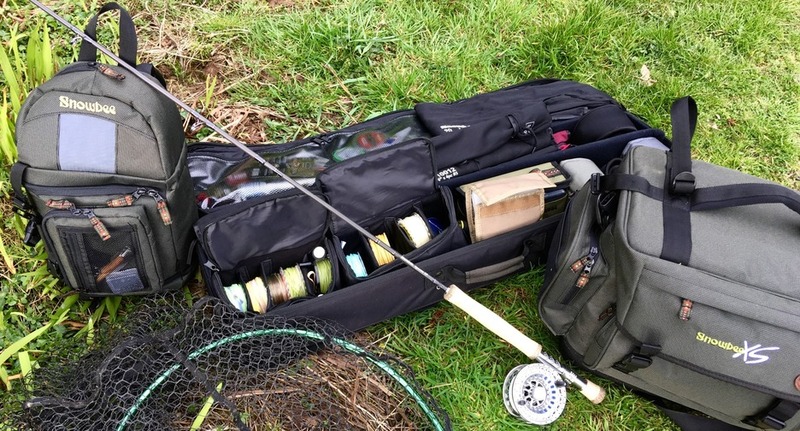 It leaves your ‘casting arm’ completely unrestricted, and when you want to access the bag, you don’t have to take it off. 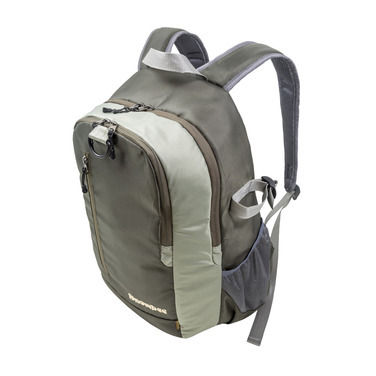 Simply unclip the side strap, sliding the bag around to the front. The pockets are cleverly designed to now be facing upwards for easy access. 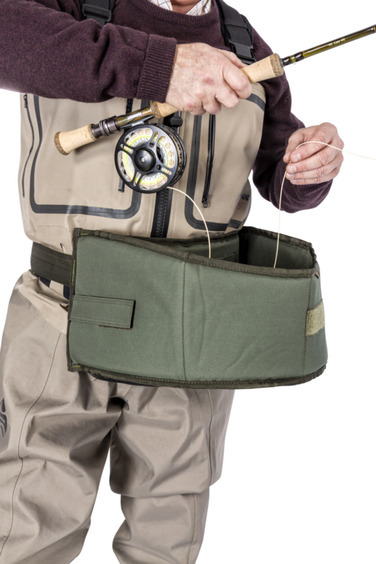 The main compartment is big enough to take your lunchbox, flask and waterproof for a day’s fishing, and if you need more room there’s a zipped expander panel to increase the volume. 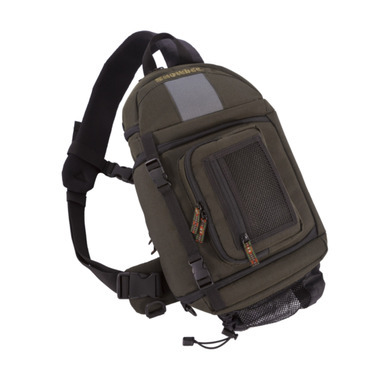 Inside there is a rear flap pocket, plus a front zipped mesh pocket for accessories. 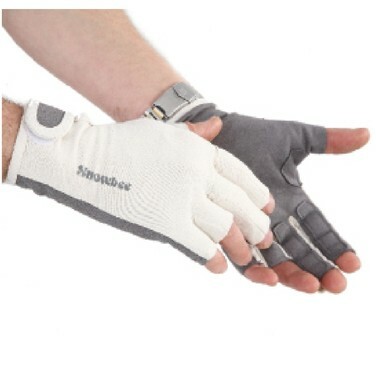 Extreme sun protection, reinforced palm and extended stripping fingers. High density microfibre and Lycra back provides 50+ UPF. Synthetic suede leather palm has double reinforcing patches. A new, hard plastic Stripping Basket so popular with saltwater and reservoir anglers. 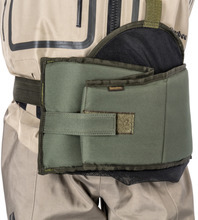 Lightweight, with adjustable waist belt and neck support strap. Tapered line control turrets in the base, to prevent fly lines tangling. 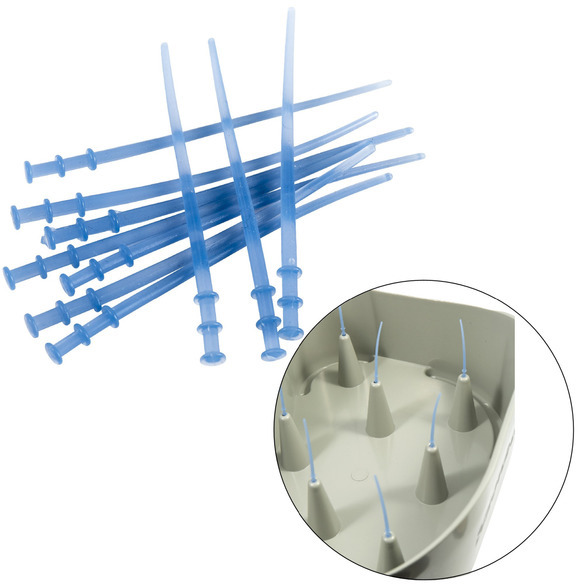 An optional extra for our Stripping Basket is this set of 10 plastic spikes, which fit into the top of the turrets. 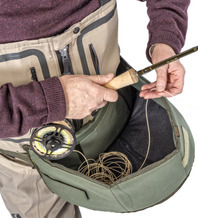 Not only do they stop water slopping up the turrets and filling the basket, but their soft, flexible construction helps tame fly line coils when shooting and reduces tangles. These will fit all brands of Stripping Basket of this same design. The best line tray design on the market. Mesh base with a fold down base board which holds the tray open when in use and prevents water filling the tray from below and tangling the line, when deep wading or saltwater fly fishing. Folds flat against your body when not in use. 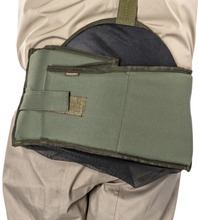 Adjustable webbing belt with quick release buckles. Velcro pocket inside, to take leaders etc. Designed specifically for saltwater wading, eliminating the conventional zip fastening, prone to jamming when wet wading on sand. 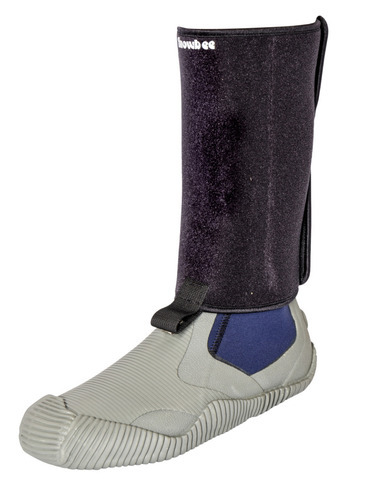 The Velcro compatible material allows the gravel guard to wrap securely around your leg and secure in any position, completely preventing fine sand and gravel entering your wading boots. Lacing hook attaches to boots to hold them in place.